The news that the Donington Park circuit has managed to steal the British GP from Silverstone, effective from 2010, is a bit of a surprise, especially to those who have seen rumors come and go so often in the past. As Grand Prix dot com points out, this may not be quite as certain as the FIA and Donington's owners maintain, it being unlikely that the neccessary improvements to the circuit could be completed in time. For the moment, however, it looks as though the deal is done and F1 fans must mourn the passing of Silverstone's GP. Whatever its problems of access and accommodation, the Northamptonshire track has been one of the highlights of the season for decades and one of the fastest circuits still in use. Multiple alterations meant that it lost its battle to be the quickest long ago but it is still a challenge that the fans and drivers enjoy. Donington has only Senna's wonderful win at the European GP of 1993 to set against Silverstone's record but it is not a bad track - perhaps a little short for GPs. The fact that it has the same problems as Silverstone plus a few more does not seem to have bothered the money men and it is tempting to think that Bernie has accepted the package offered purely so that he no longer has to deal with the BRDC, something that has irritated him for years. Looking on the bright side, I suppose we should be grateful that the deal means Britain is guaranteed a GP for many years to come. The problem with that is the uncertainty of Donington being up to the standard expected in time. With Silverstone out of the picture and the potential for an Octagon/Brands Hatch type of fiasco always present, it would be premature to think the British GP safe at last. Ultimately, the answer may lie in alternating the GP between the two circuits, as has proved necessary in Germany and Japan. Whether such a deal could ever be arranged, I don't know, but it would be preferable to abandoning Silverstone forever. F1 needs its few remaining links with its past and there is no denying that the first circuit to stage a championship round is an important part of F1 history. Much water has to flow beneath the bridge before the Donington GP becomes reality. Although it is true that what Bernie wants, he usually gets, too much depends this time on a private investor having sufficient funds to get the required improvements done. Such things have a habit of exceeding cost expectations and it would not surprise me if doubts were to arise in 2009. When much of the expense is in providing the FIA with a down payment that does nothing to assist in construction work, one has to conclude that the owners have a mountain to climb. I wish them luck as I would rather have the British GP at Donington than not at all, but I cannot help but feel somewhat sceptical. As they say in Missouri - "Show me." All the same, perhaps I should reconsider my travel plans for next year, and make a trip back to the UK for the "last" race at Silverstone. Sure would be a shame to miss it. Gollum has been trying to blackmail the British Government for years to get the money he wants. This is the punishment for their refusal to play ball. He has no care for the sport or the fans as long as he gets his money (of which very little is ever re-invested in the sport) It would be like charging Wembley £11 million to host the FA Cup! I for one am ashamed that he is British as his attitude flies directly in the face of the most loyal motor racing fans in the world. The sport is rotten to the core and I am getting more and more fed up with it. On one hand we have the huge Ferrari bias in the FIA and on the other we have Gollum and his love for shiny things! It is about time the teams split from F1 and started their own championship. (Obviously Ferrari would stay on their own, happy that they can win without a challenge). You are being a bit unfair on Donington's history Clive. Donington had history before Silverstone was a circuit. The gentleman behind Donington was interviewed at the weekened and his comments lead me to believe that there will never be a GP at Donington and Bernie spotted him as a mug and signed the deal to put pressure on Silverstone and to pick up a few million that will guarantee releasing the unfortunate creature from his contract. He intends to fund the improvements by a debenture scheme. He has neither plans nor planning permission. The road links to Donington are nowhere near good enough to handle a GP crowd. In fact they couldn't cope with the recent World Series by Renault championship visit and it is a distinctly third rate series. So in two years he has to raise capital, draw up plans, get planning permission, build everything and get safety certificates. Who is going to invest in a project that no-one believes will ever happen. There is going to be a train station with a direct link to London serving Donington Park by the end of this autumn. But I can't see the government giving the Donington Park owners any more help than that. I'd like to think that Donington's owners can pull it off and get the race going, but I am worried. That said, the British Grand Prix is a protected race, so Bernie may well be forced to return to Silverstone if the Donington project falls over. As regards Donington's pre-war record as a GP track, Steven, I was aware of it but was thinking in terms of F1 when I wrote the fateful sentence. In historic terms, it is true that Donington wins, Silverstone being only one of the many airfields that littered Britain during the war, but it has earned respect in the last 50 years, I think. At the same time, Donington has done great work as the venure for many other formula races but can boast only one F1 GP - that has to be an important consideration. The most important aspect to this whole business is the impossibility of Donington being ready in time, and I think Lee is right to imply that this is just a ploy by Bernie to either force more money out of Silverstone or drop the British GP altogether. And the worst of it is that, for once, Alianora is not quite correct in saying that the British GP is protected - the likelihood is that, if Donington proves unable to meet the timescale, the GP will be replaced by another in some other country and any alleged protection won't matter a damn. 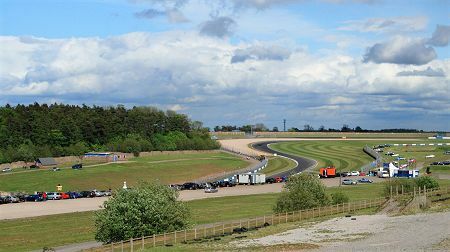 I am actually in favour of Donington being used as a GP venue (believe it or not), as it has a much-needed ingredient to great circuits - plenty of change in altitude. But to run with such a half-baked and unlikely scheme as Bernie has agreed to just guarantees that there will not be a British event in the F1 calendar in future.